Before you can setup the reviewing and scoring page, make sure you have connected your reviewers to the topics in Eventure and have uploaded the reviewer module to the internet. Select ‘Abstract scoring page’ from the administration menu. The screen that enables the reviewer to score the abstracts in the assigned topic, based on the specified criteria appears. 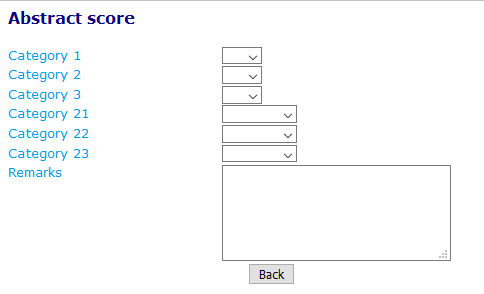 The scoring criteria labels are configured in the usual way. The first twenty possible criteria can be scored with a number between 1 and 10. (Illustrated above left). By clicking on a category in the margin it can be configured in the usual way. ‘Extra’ (a) allows you to specify the scoring options for the category (b). The number of options (1 to 10) are indicated in ‘Number in listbox’. You can also activate the ‘No opinion’ option’. You can indicate the importance of the scoring category in ‘Weight factor’.